I live in Portugal, and just bought a 3G from Amazon.com (Amazon.co.uk, which would have allowed me to save postage and import duties, refuses to ship the Kindle here, although they do ship their other products here – seems to be the case for all pf Europe). NO 3G web browsing (apart from shopping in Kindle store) seems available. I only get the message “Due to local restrictions, web browsing is not available for all countries”. I am becoming really pissed off paying 50% more than in the US for devices that don’t even work as well in Portugal. I assume browsing is been switched off when shipping to foreign countries. If only Amazon would be clear about what one can and cannot do we could make informed choices. This experience really switched me off Kindle and Amazon in general. My advice to Europeans – have Kindle shipped to a friend in the same country as you are buying it from and have them ship it on to you. Which is a bit ridiculous now that we live in one world wide web…Amazon intentionally places national borders on the web. Shame on them. My experience in using my Kindle 2 outside the US is that the Whispernet detects where am and waning messages are sent to it from Amazon. So the advice to have a new Kindle shipped to a country where the desired services are not restricted may not be sound! I am using Kindle 3 G free +wifi,it’s PAIN using the web browser, currently most of web pages designed to open multi-windows at the same time, and Kindle browser just couldn’t open all these web pages, only single window, so I could only read headline on the web page, that’s all. because no way to figure out the link’s address. Don’t expect too much! I live in Portugal also and am really interested in getting a Kindle and it would be amazing if I could get 3G with it just so I can have a quick look on my email and facebook (otherwise I go weeks without going online and speaking to my family because of my living situation). I am so confused about all the t&c’s! It looks like they may charge for accessing other websites, and possibly 3G isn’t available in Portugal at all (despite getting it shipped to UK first). Does anyone know??? It’s a bit of a deal breaker for me as I’m out in the middle of nowhere and not likely to get a phoneline for my own internet soon and I cannot afford to run a dongle for my pc! I own A Kindle, and am very impressed by it! I have the Kindle 3, with 3G. It isn`t that fast, but it works! P.S. I am using the kindle right now to type this comment! Wow…. I’m really puzzled… I’m from Uruguay and I was going to buy the Kindle 3 with “free” 3g… but now I don’t know. It seems that de 3g browsing it is only available for “kindle store” and not, for example, to check my gmail account; in that case I would just buy the kindle wifi (without 3g), since it is cheaper. And I suppose (tell me please if I’m wrong!!!) that de wifi feature will allow me to check my email and other stuff. Please give me some advice!! I just got a new Kindle and the first time I experimented with the web browser it crashed the whole device. I have never had a Kindle before so this whole world is new to me. Anyway, I think I’ll just stick to reading books on it. i have a kindle- the cheaper one i think thats the one that only has internet where there IS internet like my home. i can go on google, my email,m facebook and everything on it, i hope its not costing me! hope this helped!! Im very interested in buying the cheaper model of kindle but I would like to know if I can use google on it in a successfull way?! I would lk to hv sm comments of experienced users,pls! @LOL @Maria yes you can browse the web on the cheaper model but only when you have a wifi connection. Amazon won’t charge but the wifi provider might, if you are in an airport, hotel etc. Well, a big attraction of the Kindle is that Amazon gives you free worldwide 3G internet. Purely as an ebook reader, it is also better than an iPad in my opinion – smaller, handier, readable in sunlight. I would like to point your attention to a new website called http://www.anysubjects.com as it is the very first website designed to be a Kindle – friendly website portal. It contains information on around 1000 websites so far. 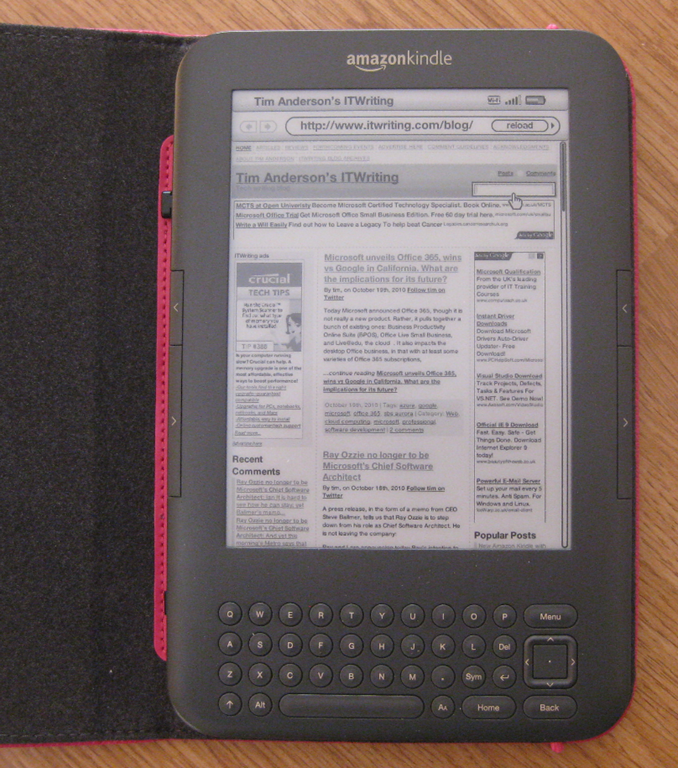 All the websites it links to can be viewed on a Kindle without the user needing to change their text or screen settings, making it much easier to surf using a Kindle. The site has been an instant success, with lots of people emailing it to thank the developer for building it, and describing how it had made having 3G on their Kindle all the more worth while. I would love you to also find the time to review it and share this site with your readers as I want every Kindle user to get to know this site and what unexpected things it can let them do with a Kindle. Yes – the “free 3G is just a bait to sell you (more) books, this is how they make money. is the 3G free usage subject to some “small writing” clause – i.e. you have to buy ONE book per month (say) or something like that?. Could it be that the average Kindle user will buy few books anyway ( main use) and they do not happen to notice the clause? 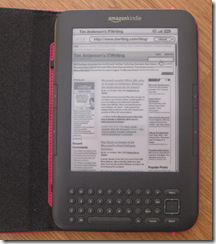 Kindle is a great ebook reader but browser is far from perfection. I prefer to browse through kindalex.com – it converts web pages to Kindle-friendly mode. And there is a bookmarking services also. Just bought a Kindle 3G for my wife to entertainment next week in Anaheim. Discovered no 3G coverage in Oakland, CA hills (10 miles from SFO). Amazon’s map showed full 3G coverage. Had to use the home wifi. Will be interesting to see how 3G works in Anaheim. I live in Venezuela and im planning to buy a kindle keyboard 3G. does the 3G work for web browsing or not because thats really important for me.